- Lipcote and a Next eye shadow set. I still use and love Lipcote but I think (and damn well hope) we can all agree that my writing and photography skills have improved a lot since then? 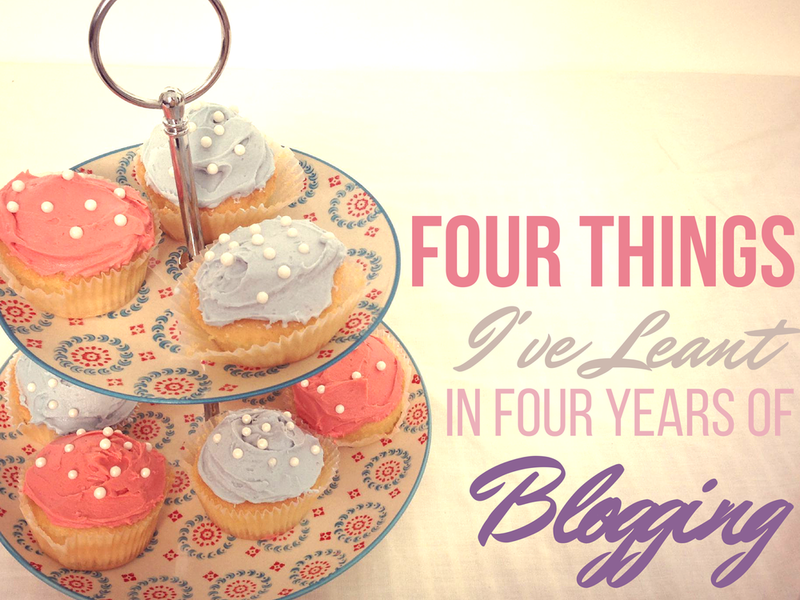 Besides developing the obvious skills that coming with running a blog, I feel that it's taught me a lot more - here are my top 5.
. For at least a year (possibly two) I fretted over every single post - wondering whether it would fit into the perfect white background world of blogging that had emerged into the mainstream. Blogging really took off and so did the technical side - SEO, social media strategies, expensive photography equipment etc etc. I felt completely lost - I was just a teenager writing from her bedroom. Out of anxiety, I stopped writing for a while or forced posts out when I could and that definitely showed. I felt like I wasn't good enough to blog but how can you not be good enough or fit in when you're writing on your own platform in your own space? I feel like I have overcome this now and can finally create content that is honest and reflects me - even if it is a little bit sweary sometimes! Following on from the theme of blogging anxiety I feel that I am finally learning not to give myself a hard time if I don't or can't write/create content. If you've been a long time follower you'll probably see a pattern emerging in my posts and it centers around my academic calendar unfortunately. In fact, over the next few months I might seem to disappear again because I'm finishing University (eep). However I'm normally extra active on other social media such as twitter and instagram during busy periods because I love to procrastinate on them! This would actually be one of my top tips for any blogger out there who feels a bit disconnected from blogging. Getting more involved in the blogging community really does pay off. I began chatting more and more to fellow bloggers on twitter, commenting on others blog posts (we are all guilty for forgetting to!) and just generally being nice to people. You get so much out of this because 1) you make new friends and connections 2) people will return the favour 3) it really inspires and spurs you on to write more. 4. Share it with your close ones. It took me a good few years to tell my friends and family I wrote a blog. I actually did this by creating a facebook page for my blog and inviting everyone on my friends list to like the page - a really clever way of 'coming out' if you're struggling to tell people. It is very daunting at first as some people do find it a very odd hobby, however in 2016 blogging seems to be becoming a lot more popular and well heard of. It is also good for promotion of your blog - you're close ones are usually your cheerleaders and I've received several really exciting opportunities through telling people I have a blog! These are just a few things I've learnt from blogging but I will be talking more in the future about what I wish I knew when I first started, as well as some tips and tricks for new bloggers.